Everything you need to find small cracks, flaws or fissures in surfaces. 3 Piece Kit that contains a powerful cleaner, penetrant and developer. Reliable identification of even the smallest cracks. Our Weicon Crack Testing Dye Penetrant Flaw Identification Kit is a specially engineered solution for finding small surface flaws. It has been developed by Weicon in Germany and is designed to be easy to use yet highly reliable. 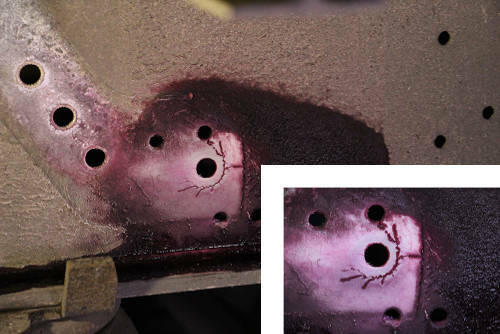 How to use our Crack Testing Dye Penetrant Flaw Identification Kit. There’s a simple, 4-step process involved in finding flaws with this kit. Step 1 – Clean the Surface being inspected. Using the Crack Testing Agent Cleaner, clean the surface that will be tested. This industrial-grade cleaning spray is fast acting and very easy to use. It cleans dirt, oil, dust and other types of soiling that could otherwise affect the test. It also evaporates without leaving behind any residues which results in less clean-up. Step 2 - Spray on the Penetrant and allow it to react. Grab the can of red, penetrating colour and spray the testing area. This technical spray has excellent penetrating properties which enables it to help identify even the smallest cracks, fissures and faults before they become bigger problems. 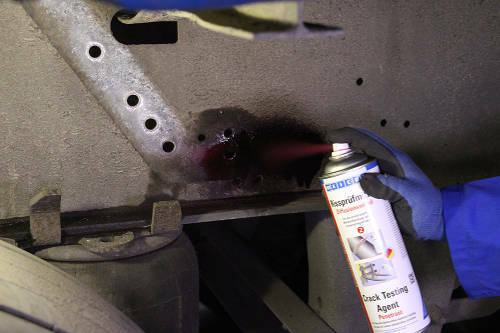 Step 3 – Clean away any excess Penetrant. 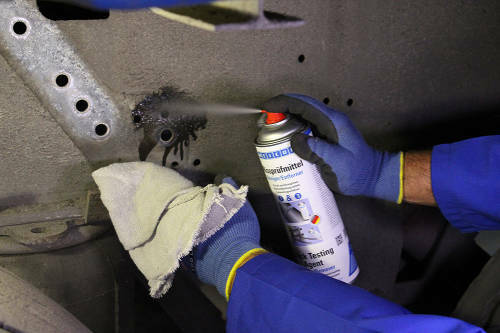 Once you’ve allowed a little time for the penetrant spray to work its way into any cracks, remove the excess with a quick clean using the included cleaning spray. This will make finding any flaws far simpler in the next step. Step 4 – Apply the Developer and Inspect. The final step in the process; spraying on the developing agent. Once sprayed, the Developer will create a white background surface while cracks, flaws or problems will remain red. Our Crack Testing Developer Spray only needs to be used sparingly and is very effective. Once you’ve applied the developer, we suggest performing a visual inspection of the surface after about 5 to 10 minutes. 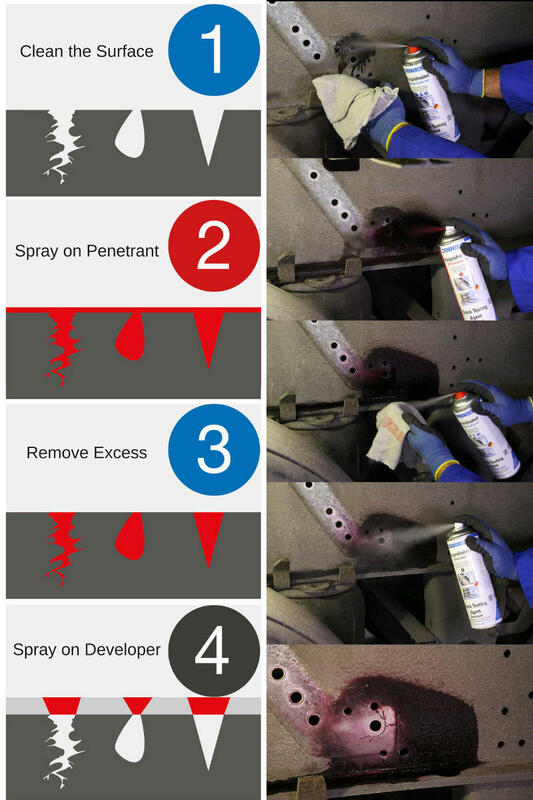 How to Buy our Crack Testing Dye Penetrant Flaw Identification Kit. We are pleased to offer this professional-quality Crack Finding System both as a complete kit and as individual sprays. The kit is available directly from this page and contains 1 can of Cleaner, Penetrant and Developer. Links are included below, via which, you can buy each spray individually.